Twitgoo is an online photo sharing for Twitter that allows you to upload and share photos in your Twitter. All you need is to login with your Twitter account. Twitgoo is similar to Twitpic, a similar service for twitter that I published before. Today is another special day for this blog. Yes it is two years old now. I have published 239 posts including this and received 930 comments which are so encouraging. Without your comments and visits, I am just like speaking alone in a lonely house. Thanks so much and I will try to improve my writing and publish quality posts as much as I could. Fun Photo Box which is similar to Photofunia, allows you to make funny photos with so many ready made pictures from billboard to Hollywood movies. I published UserNameCheck, a tool to check username for many social networking websites, before. 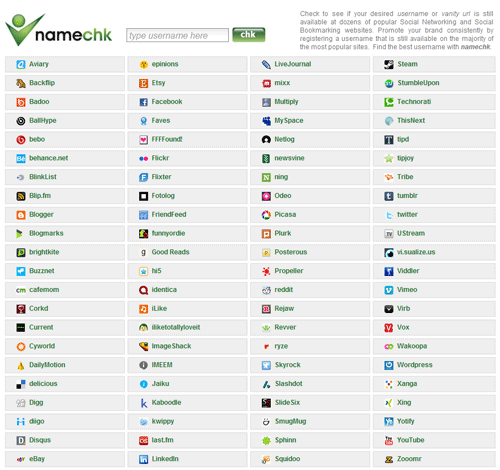 NameChk, it is similar to UserNameCheck that can check username on dozens of popular Social Networking and Social Bookmarking websites.